The Seto Inland Sea is a fairly salty sea. It is a small sea that divides Shikoku from Honshu. It is well known for its shellfish industry with a lot of oysters being produced up and down the sea. It is also a very salty sea with a healthy salt industry having spawned from the waters. While the salt industry is not very famous, visiting Naoshima brought me some awareness into the industry itself. They have various salt based products that are, for lack of a better word, interesting. I wouldn’t say all of the products are good but it does spawn an interesting mix of products. The first product I tried was the Shio-cider, salt cider. It is a simple cider that has extra salt added to it. People often say that adding salt to watermelon or other fruits will enhance the sweetness, but if you ask me, I prefer it naturally sweetened, or sour. The Shio-cider was not good at all. I found it to be overly salty and it made me feel thirstier, even though I was drinking a drink that should make you feel refreshed. I should have gotten the olive flavoured one, but I doubt that would taste much better. One great combination was the nori. Nori is another famous product from the Seto Inland Sea, and again it is a common product all over Japan. Their own nori is salted with the Seto Inland Sea salt, but to be very honest, I don’t taste any differences in the products but comparing the salt cider to the nori, I would buy the nori again in the future. It is fun to try things out and see if you can distinguish the flavours but to be very honest, I can’t do it myself. Give it a try if you want, but don’t be disappointed if it doesn’t live up to what you expected. 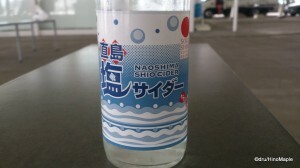 This entry was posted in Shikoku Food and tagged Cider, Honshu, japan, Kagawa, Naoshima, Nori, Salt, salt cider, Seaweed, Seto, Seto Inland Sea, Shikoku by Dru. Bookmark the permalink. “It made me feel thirstier.” Maybe that’s their marketing trick: make ’em thirstier so that they drink more! Yup. Really strange, but something I just had to try. Marketing works. Why do you think bars give salty nuts. To make you buy more beer and drinks.